Square edged laminate worktops are the cost effective solution to the curved base units & end posts found in today’s fitted kitchen designs. Curved base units and end posts are not a cheap design feature so the curve on your worktops really needs to follow the curve exactly and as no two manufacturers make their curved products the same then a “one size fits all” does not work! That is where our curved worktops, manufactured to meet your exact requirements comes in to their own. It is so important that the radius of the worktop follows the radius of the curved component. Yes the curved units look stunning and also work well in tight situations, however if you put an off-the shelf curved worktop with a radius of say 260mm and you really require a radius of 230mm – how does that work? Sorry it doesn’t! Sometimes it can be difficult to obtain the correct information from your chosen kitchen supplier although there are some very good companies out there who are more than willing to supply you with the radius of the door or carcase. If you do have difficulty obtaining the radius, the information below should help you to work it out providing you already have your kitchen units or are simply replacing an existing worktop. Place a straight edge along the worktop / carcase edges & mark the point where the worktop/carcase starts to curve away from the straight edge [ A ]. From this point [ A ] extend the lines at 90’ to the worktop/carcase edge until the two lines cross. Measure the length of each line [ X ] They should be the same length, give or take a mm. If the measurement you have just obtained is say the carcase size, you then need to decide on how much the worktop will overhang the carcase and this is often dictated by the carcase manufacturer. 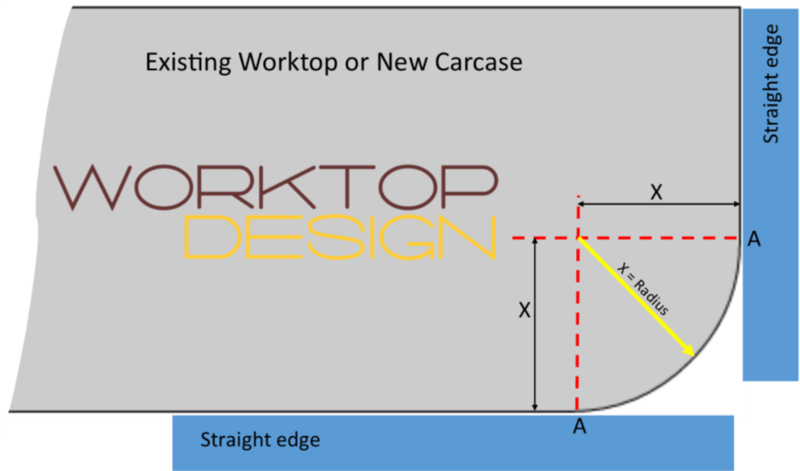 The most common depth of base carcase is 560mm or 570mm – although there are one or two manufacturers that make their carcases slightly deeper – and the most common depth of standard worktop is 600mm. If we use a 560mm deep carcase for this example, a standard 600mm deep worktop will therefore overhang the carcase front edge by 40mm. So if by using the methods described above you have calculated the carcase radius to be say 190mm, the worktop radius will be 190mm + 40mm worktop overhang = 230mm. If your carcase is in fact 570mm deep the worktop radius will become 220mm. Please do not hesitate to contact us on 01270 764833 if you are not sure or indeed require any further help or advice.